Put the boat in the water at Indian creek about 7 AM, I could see top water striper activity right out in front of the ramp. 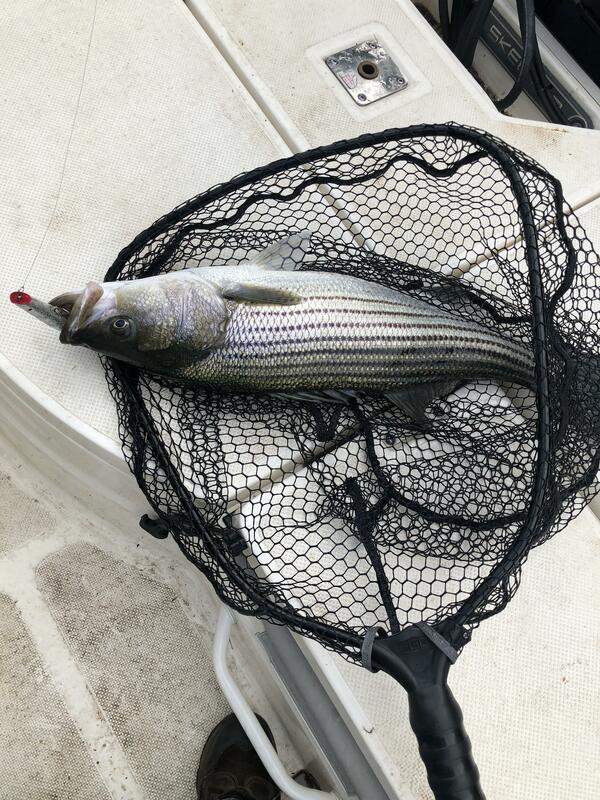 My plan today was to fish for black bass, but seeing those stripers made me change my plans. My one regret is not getting there 45 minutes earlier before it got light. Anyway got after them, throwing, targeting the ones I would see breaking water. Did a lot of chasing, they are spooky, the water is clear, and the shad they are chasing are small. A lot of times they would not go after my topwater (Evergreen Shower Blow 135), but once in a while one would blow up on it. And I mean explode, that's most of the fun, just seeing those big pops. I boated one that was in the 10-12 lb. range, a couple of 3 lbers and a couple of spotted bass. Missed several, had one knock the lure about 3 feet in the air, came after it again once it hit the water, missed it, then after I walked the bait about 10 feet it blew up on it again and missed. Had another one pop it twice and miss both times. Had a couple of brief hook ups also. It kept me pretty entertained for about 2 hours then it shut down. There was another guy out there who looked to be doing the same thing I was doing and I saw him boat 2 stripers. Went back into Indian once the top water bite died to try for some bass - had two bites on a swing head with a Menace Grub and that was it. I quit about 11 AM. WT right at 60 degrees. Congrats QB! I missed out on a chance for some big stripers here in MD. Next year need to find a boat. That spotted bass sure had the big eyes on when it hit that top water. Good luck Dan! I am probably won't be out chasing them again until after the forecasted nasty weather blows out which looks not to be until next week. I just hope it doesn't end the top water bite. It figures, just about the time the good top water action starts, I'm laid up at home recovering from surgery. Hopefully the top water bite will still be happing in a couple weeks when I'm out and about. I love all kinds of fishing, bass ,crappie and even sunfish when the mood suits me but few things are as exciting as a big fish blowing up on a top water bait! Thanks for the post Quill! You guys get out there and enjoy the excitement!